This beautiful church is a faithful replica of the original edifice built in 1885 and destroyed by Hurricane “Iwa” in 1982. 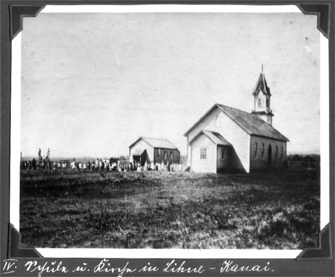 Our congregation was started in June of 1881 with the arrival of a group of German immigrants, who came to work at the Lihue Sugar Plantation. It was a trip of nearly six months, sailing around Cape Horn. The long experience on board ship was reflected in the architecture of the church, as they carried out the symbolism of a ship as descriptive of the church. The floor slants like the deck of a ship; the balcony is the captain’s bridge; the ceiling is like the hull; the lights are ship lanterns; and the pulpit the forecastle. The altar painting is an original work by Ernst Marx (1864-1942). 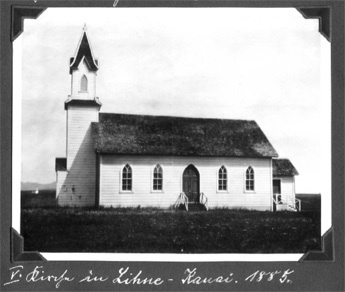 Paul Isenberg, called the father of Lutheranism in Hawaii, was the son of a Lutheran pastor in Hanover, Germany, and came here to work on the Plantation–becoming its president. Paul arranged for his younger brother, Hans, who was an ordained Lutheran pastor, to serve this congregation from 1887 until his death in 1918. At his death his wife, Dora Rice Isenberg, took much of the responsibility of the ministry as well as serving our island.